Then, it was onwards and upwards, over mighty Mingus Mountain, veering off towards the diminutive settlement of Mayer (think Circle K, library, motel and not much else). 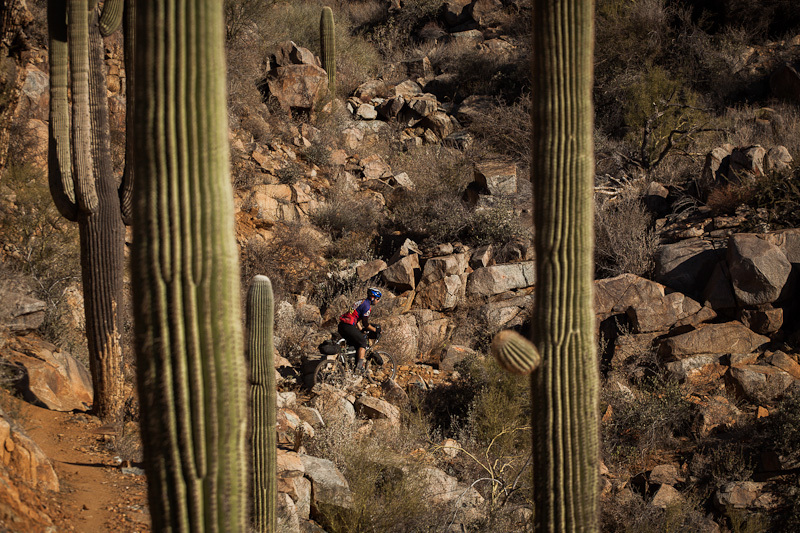 After camping out outside the fire station, we picked up the saguaro-themed Black Canyon Trail – 78 miles of parched desert singletrack that hugs the steep canyon side, wending its way south towards the sprawling metropolis of Phoenix. Logistics-wise, I used Ridejoy to share a ride from New Mexico to Arizona. As luck would have it, I hitched a lift all the way back to Santa Fe from a windswept roadside gas station, listening to cool music like this – thanks to a DJ who was not only kind enough to stop, but also completely rearrange the contents of his car to accomodate me, my dusty bags and the goliath Krampus. Cheers Emile! James rode his trusty Long Haul Trucker, down in the drops, valiantly defying a barrage of rocks, snow and ice. I feel a new bike may be in his future… Salsa’s Fargo looks to be a strong contender. As for me, it was the first time I spent a few consecutive touring days on the Surly Krampus. Without doubt, its balloon tyres did much to smooth out the often rugged and rutted terrain, flattered my bike handling skills in the process – not that a rigid 26in bike seems to hold back these riders too much… As heavy as they are, the 1200g, 29x3in Knards didn’t prove to be as much of an issue as I was anticipating for distance riding – though given the sandpaperyness of desert rock, their eventual $90 replacement cost might well be… All good on the tubeless front too – the recent conversion held up great. But note to self: time to expand the Krampus’s gear range from a 1×9 to a more generous choice, if other bikepacking forays are on the cards. More on those thoughts later. Thanks are due to James for his picture-taking patience, and to Tim and Topofusion Scott for sending us a gpx file of the route – which made navigation a breeze. 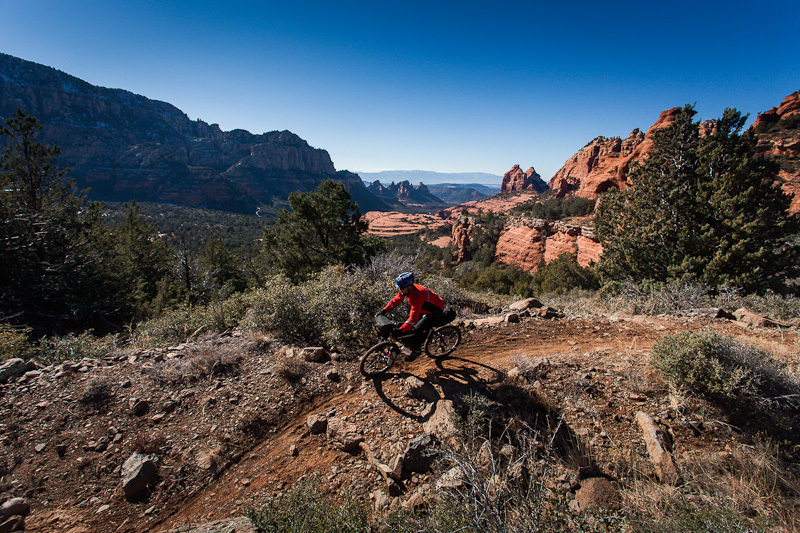 For this kind of backcountry, singletrack touring, a GPS really maintains the flow of the ride. Thanks too to the folks at Over the Edge, Sedona, for helping James resuscitate his bike back life after a nasty fall on the Old Munds Wagon Trail. To the firemen who invited us in from the cold. And to those who reacted to our outstretched thumbs and gave us a lift. The Black Canyon Trail: Land of the Saguaros. Glad to hear this site format is not the final product! I find the white background really painful to read…hell on the eyes. Love the blog in any layout, though. I kind of like how clean and simple this layout is – it’s the WordPress default theme. The new website will be significantly different, although the blog will remain largely the same in style. Anyway, glad you’re enjoying the content! Really the only issue I have is that I find it very hard to read text on a white background – the white coming from the screen just burns my eyes. It may just be me but I always thought, say, a gray or other dimmer background was easier to read. Hey Cass, I was wondering how the Krampus holds up on sand, like on a beach. I think it’s time to get a fat tire bike for light to medium sand / snow applications, and just general touring and singletracking. The Krampus would be a nice way to combine that with entry into 29ers. But the Moonlander and Pugsley have fatter tires. There is a canyon down in Baja I’m looking at, it’s about 40 km of riding down a wash / canyon out to the Sea of Cortez. There is nobody there, only a few people have ever explored the area, and it’s full of nice palm trees. Thorns would be my biggest concern, and of course running out of water. Mark, I’d say the Krampus is noticeably better than a regular 29er for light sand and snow duties, but it doesn’t come close to matching the kind of float you’d get from a real fatbike. I take mine down to 10psi on snow, but a fatbike will drop down to 5psi – that makes a big difference. 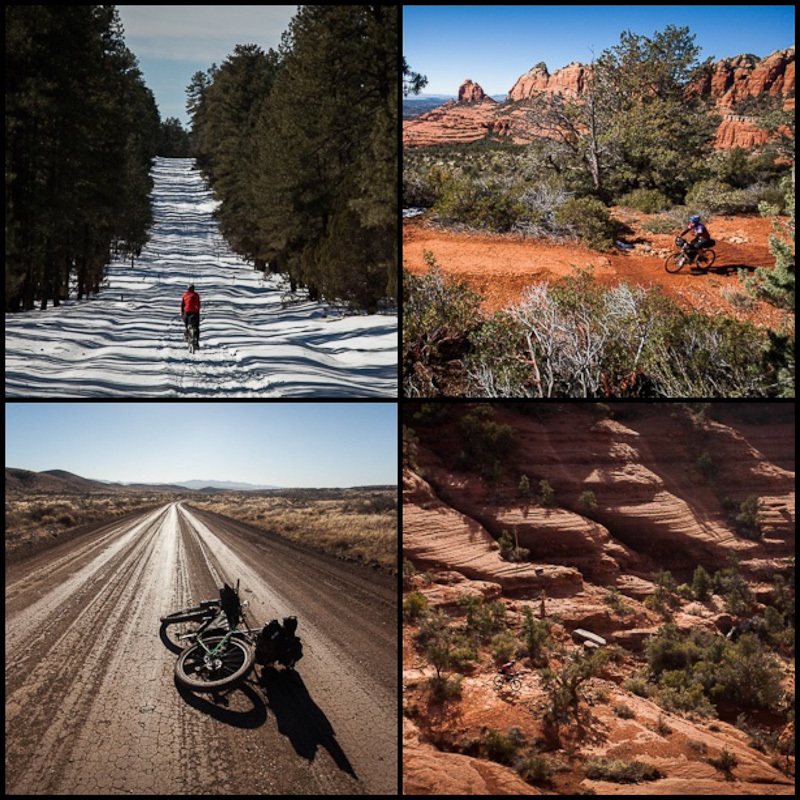 The footprint is much wider on a fatbike too – sand and snow are what it’s designed for. If you’re serious about alternative exploration, I think a Pugs or Mukluk are the way to go. I say this from a theoretical point of view, as I’ve only ridden fat bikes a couple of times. Note that the Moonlander goes one step further for soft conditions, but Pugs is lighter and more versatile. Check out the Neck Romancer (http://surlybikes.com/bikes/neck_romancer_pug) – that borrows a bit from both. I’ve been mulling this one over for a bit, as I’d love a genuine fat bike. The new Pugsleys have great value build kits this year (including lighter, cut out rims). What I like about the Mukluk is that you could build a light but strong, second set of 29er wheels for mountain biking. The frame isn’t offset like the Pugs, so you’d need to invest in a second 170mm hub (which is more expensive than a standard 135mm one) but all things being equal, it should make for a stronger wheel. Plus, the new models with the swinging dropouts have room for Knards. Both models have loads of capacity for water too. PS – If there are thorns in the neighbourhood, converting to tubeless is a must! It’s pretty straightforward though. Hmm, and it seems the Pug / Neck Romancer will accept Rabbit Holes and Knards too, so maybe that’s the way to go. Then I can still have a regular 29er, but also be able to run fat 26ers when needed. I haven’t researched the Mukluk much, more familiar with Surly. I like the standard hub of the Pug, especially since you can put another one on the front wheel as a spare. You know, I’m not sure that there’s so much advantage in being able to use your front wheel for the rear – unless you’re really out in the wilds. Also, the Neck Romancer uses a symmetrical fork, so you wouldn’t be able to swap between front and rear. Lastly, building a 29er wheel into an offset fork is also more of an issue. Just things to consider. Check out the Mukluk, it’s good value too. It’s true that the hubs are fatbike specific – but once you invest in them, I don’t think you’re likely to have any problems. A friend is buying a Neck Romancer tomorrow, so I’ll be able to report back. It certainly looks sleek. I asked the LBS’s and the Mukluk is way hard to come by. Likely a year wait, apparently. They have a Pug frame in my size (purple, unfortunately) and they can order in the Moonlander fork, rims, wheels, bb, cranks, headset to make it into a Neck Romancer. Then I’d have to finish it off with my components. But they also have a Moonlander right in the shop that’s my size, for a pretty good price, only a few hundred more than if I was to build up the Neck Romancer. But that can’t run skinny tires so I think that eliminates the Moonlander option. The only thing with the Pug is that you can’t run the Big Fat Larry’s in the back. If I was on really loose sand I might end up wishing for a Moonlander, it’s hard to say without taking a pug in really loose sand… I don’t know if you have any experience / insight into that. I guess you can’t have everything in one bike. The Lazy Rando has a good review. I just pulled the trigger and ordered a Mukluk 3 from Utah. I’ll go pick it up in a few weeks at the border. Looks like a good bike, as you say, all you are committed to is the larger hubs which isn’t that big of a deal. I’d like to get a second set with Rabbit Holes / Knards. That’s great to hear, mark, I’ll be interested to hear how you get on! The Muk 3 doesn’t come with cutout rims, so that’s a project worth undertaking – there’s lots of info online – to shed a couple of hundred grams per wheel. A friend of mine made the one below, it’s super clear, though it’s about drilling out On One rims, so the hole dimensions might be different. The other way to shed some serious weight is to move to tubeless – those fat tyre inner tubes are very heavy. Fantastic pictures – really inspiring! Yes I’m pretty excited about my new biking options. I’ve been learning a lot about fat bikes the last couple of days! But this would be an offset build so it wouldn’t be directly swappable with the symmetrical front. I guess if you got into a bind on tour and needed a new rear hub you could take a day off to switch the hubs around and rebuild the wheels (I don’t know how that works reusing the same spokes), or just build up a new 135mm hub if it breaks, they are ubiquitous everywhere. Or just ride an offset front hub for a while… I think one of those options could be made to work somehow. Now the question is whether the Rabbit Holes can be built up with that 17.5mm offset. It would be great to have a 135mm set of Rabbit Holes, one front and one rear, as a second set of wheels. Also, the Enabler fork for the Mukluk will run a Big Fat Larry. In the back it will fit but there will be chain rub. I wonder if the Mr. Whirly OD helps with that. I’m glad to see you’ve ordered the Mukluk. From your discussion with Cass, either the NR Pug or the Mukluk seemed the best option. If you have ordered a 2013 Mukluk with swinging dropouts, I don’t think the Salsa Enabler spacer will fit. It is meant for older models. For the sandy conditions you expect to encounter in the future, the Darryls are a good start. They will still ride nice on trails with 3.7/8″ tires but will provide significant float, especially if you have some BFL/Bud/Lou tires as you mention. Riding up/down sandy arroyos is on my “to do” list, as soon as I can get a few days out of town. Yes, Rabbit Holes can be built into a Pugsley although the rear wheel is much happier than the front, If using a 135mm SS Surly hub up front, the flanges are widely spaced and provide uneven tension, even with the benefit of the 5mm offset in the RH rim. The wheel will work fine, however. Thanks for that input Nick. In the interests of building the strongest second set of wheels that you can, personally I I’d bite the bullet and invest in another 170mm hub – saving the 135mm hub and spacer option for a worse case scenario on the road (assuming your frame can take them). After seeing the Marge Lite and the Rolling Darryls side by side, you can see how the Rolling Darryls eek the most of a 3.8 tyre like a Larry, as well as opening up the option of going ‘really’ big at some point. The downside, compared to the Marge Lites, if that they won’t play quite so happily with a Big Apple 2.35s or similar. Nick alternated between Big Apples and Larrys on his ride down from Alaska, which seemed to work really nicely. I guess you need to weigh up where your priorities lie. Yes, I think the Mr Whirly OD would solve any tyre rub issues. However, I suspect you’re going to be pretty happy with the wheel setup and build kit as it is, without needing to do too much to it. In any case, look forward to hearing about it. Great photo set as usual Cass. 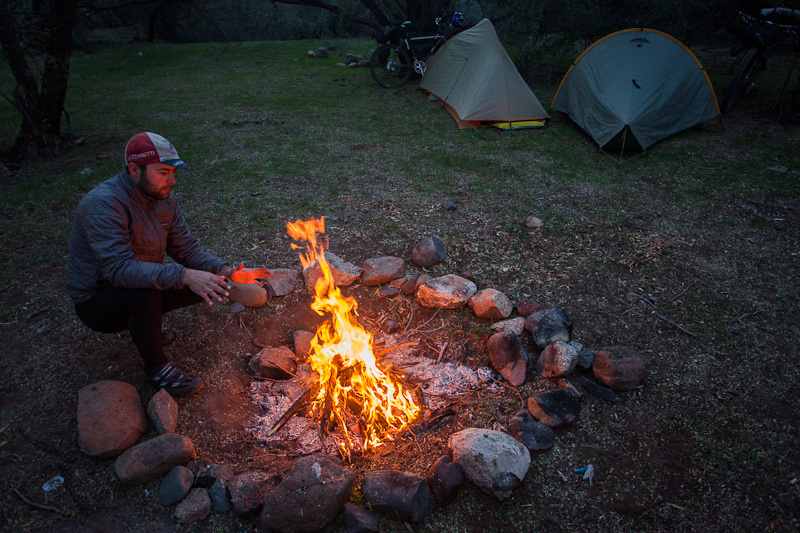 I’m looking forward to hearing your thoughts on moving away from the 1×9 setup for bikepacking. I’m going with a 1×9 on the Surly KM build that I’m working on finishing up soon, mostly to save money and keep things simple. I was actually pretty happy with a 1×9 – simple and economical, as you say. Only on longer, prolonged climbs, like Mingus Mountain, did I miss a bail out gear. To make the most of my gears, I’ve been running a 12-36T shimano deore cassette. A 36T definitely helps with a bikepacking load, though I’ve had a couple of the plastic spacers disintegrate, and have needed to replace them with metal ones. However, seeing as I have a Rohloff, I figure should put it to good use. And, an IGH deals with any dubious chain line issues with the Knards. Great site! Ive been trolling for a while and loving each post! Any chance you could break down the route for me? 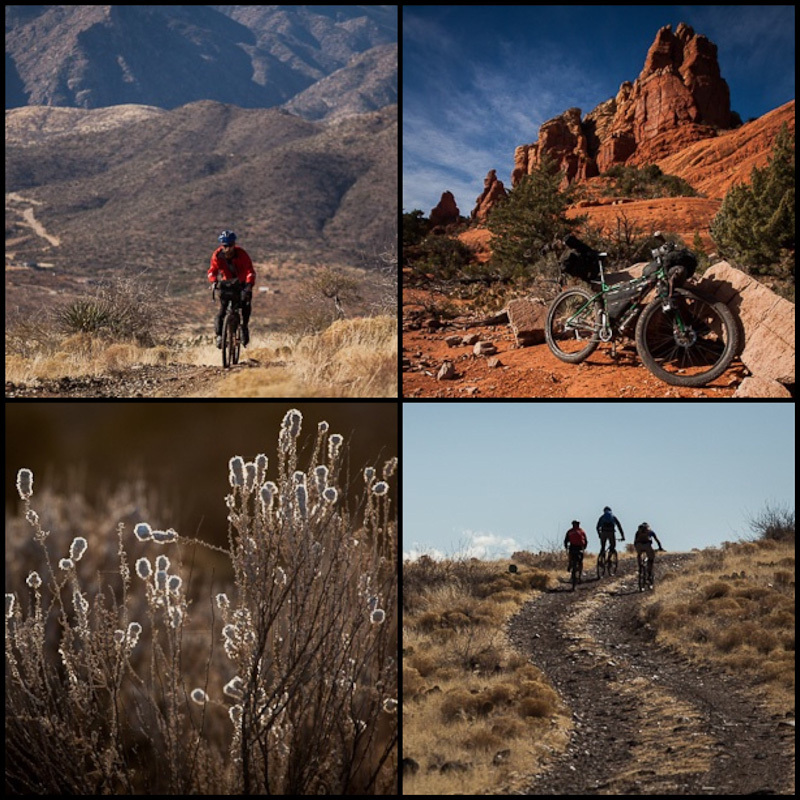 I’ve ridden BCT several times, but have been wanting to find a way to bikepacking from Flagstaff all the way home to phoenix. I’d appreciate any beta you can give! heres my music link and .. how are the babies ?